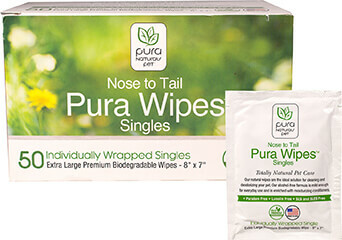 Natural wipes are the ideal solution for cleaning and deodorizing your pet. Our alcohol free formula is mild enough for everyday use and is enriched with moisturizing conditioners. MADE IN THE USA. A gentle yet effective formula designed to help dissolve ear wax and remove foreign debris. Can be used as often as needed and is especially recommended after bathing or swimming. From the Manufacturer: Rinseless, waterless foam shampoo gently cleans your pet without all of the hassle bath time. Natural botanical formula cleans and moisturizes pets' coats. Easy to use & Stress free! MADE IN THE USA. VitaPet Senior is a stress formula especially for the older, lactating, pregnant, or more active dog. Veterinarian recommended and scientifically formulated to supply dogs with essential vitamins, minerals and nutrients that may be missing in their daily diet. Contains Glucosamine for added joint support. Chewable Tablets that tastes Like a Treat!